Ben Wishaw returns as loveable bear from darkest Peru in Paddington 2. Well, well, a sequel that is even more fun than its predecessor. It doesn't often happen but Paddington 2 manages to shift the stale marmalade sandwiches from 2014 to deliver a pacy, enjoyable adventure, which boasts a cameo cast that is like a who's who of British acting talent. Paddington 2, without giving too much away, is a whodunit caper in which we all know who the baddie is from the get-go. The honour of framing everyone's favourite furry friend from darkest Peru goes to Hugh Grant who gives a performance that perfectly frames the dastardly characteristics of waning theatre star Phoenix Buchanan. He delivers a handsomely over the top performance as he plots a heist that will secure his return to stardom and fund his mania for a one-man show. Paddington's idyllic life with the Browns of Windsor Gardens is interrupted after he sets his heart on a gift for his great-aunt Lucy's hundredth birthday. The book, a unique pop-up book, which unknown to the bear contains clues to the whereabouts of a hidden hoard of treasure, was thought lost after decades out of the public eye. Mr Gruber, Paddington's dearest friend and antique shop owner, agrees to put the book to one side while he embarks upon a series of odd jobs to buy it. However, after an encounter with Buchanan at a Victorian fair, Paddington (expertly voiced by Ben Whishaw) lets slip about the book and the pantomime-style villain heads off to pinch it. 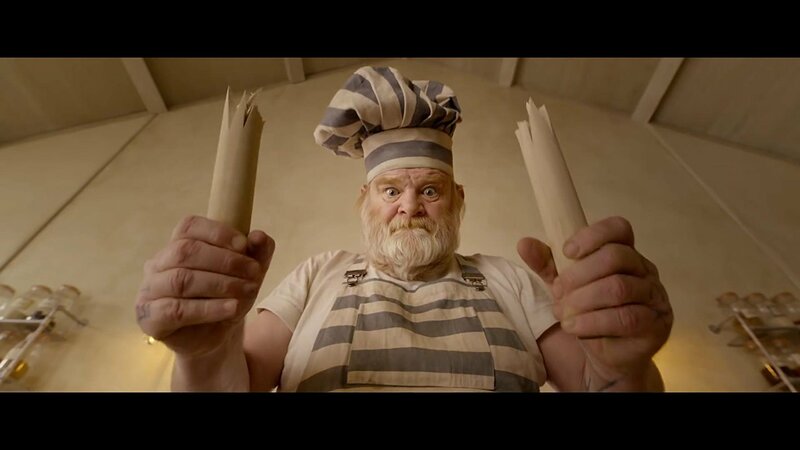 Making a living as the face of a popular dog food brand is no longer tolerable for the distinguished artiste and after he is disturbed on the job, he uses trickery to escape and in the process frame poor Paddington to a spell in chokey. Young minds might get the wrong idea about the rehabilitative purpose of prison as the little bear breezes through his sentence and has a jolly nice time making lots of new friends - including the fearsome Knuckles McGinty (Brendan Gleeson) before choosing to join the lags in a breakout. There's a vintage Harold Lloyd flavour to some of the scenes, particularly the climactic train chase that mixes slapstick with hair-raising action as possession of the book swings one way then t'other. This joyful film maintains the smiles right through the end credits as Buchanan finally gets the captive audience he craves for his one-man show with a brilliantly camp song and dance number. A stellar cast including Tom Conti, Imelda Staunton, Michael Gambon, Richard Ayoade, Julie Walters, Hugh Bonneville, Joanna Lumley and Jim Broadbent keep the fun moving and hit the jokes at just the right time. An exceedingly good film! Showing in cinemas nationwide now.